If you have any questions or suggestions you are welcome to join our forum discussion about Further Talk on Strong Trends. 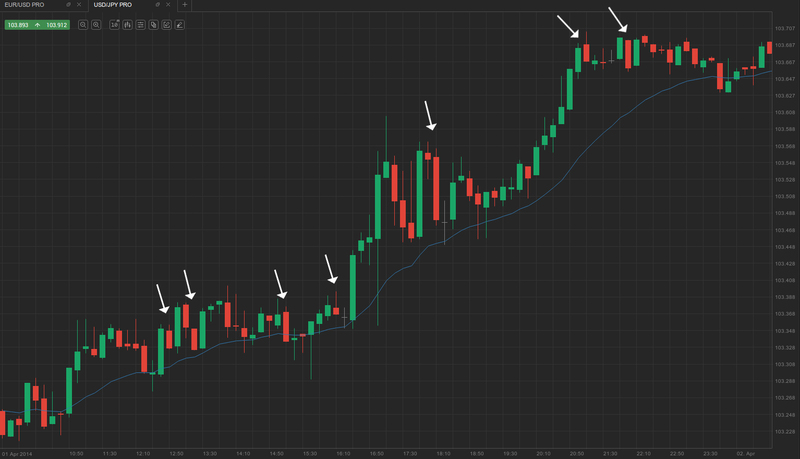 Because strong trends don’t give traders good pullbacks for many bars, you can occasionally switch to lower time frames to initiate with-trend scalps, while holding your swing position. However, a much too smaller time frame than what you are used to will also make it harder to trade. First, you will have less time to make decisions, i.e faster chart reading is required. Another drawback of smaller time frames is that they will now display counter-trend setups as well, apart from the with-trend ones you want to take advantage of, thus further impairing your trading session. This is why switching down to lower time frames from the usual you use is not advised for inexperienced traders. A key mistake that constantly drains novice traders’ accounts over time is betting against the market in a strong trend after a good reversal bar has formed, when it is actually with-trend orders they must place. Take a look at the following screenshot. We said earlier that long trends last that much because they make traders chase them. In a bull trend, for example, bulls keep waiting for a strong signal bar so that they can enter with a full position, while trapped bears await further evidence that the trend is strong in order to decide to exit. However, that evidence doesn’t come, but both of the counterparts ignore the fact the market is only doing small pullbacks and is remaining well above the moving average. Because what they wish for does not occur and both bulls and bears keep buying in small pieces, while waiting for a decisive move, the market keeps grinding higher. At the same time, strong bulls see very clearly what is happening on the market and are buying aggressively, adding to the buying pressure, which pushed the market up. During strong trends, strong bulls (institutions), which typically possess enormous capital, want to buy in huge amounts, but at a lower price so that they maximize their profit. However, because that lower price does not come and they know that the market will continue to edge higher, they are forced to buy at higher prices, but they only do that in pieces. By doing so, they are steadily increasing their positions at a higher price, but they are sure that the market will continue rising. Moreover, by buying in pieces and not dumping all of their buy orders at the same time, they are protecting themselves from causing a buy climax, which could after that turn into a reversal and bring the market below their average buy price. The strongest trends are defined by the absence of pullbacks, or when they are very shallow, reflecting the strong with-trend price pressure. A very distinct sign of strength is displayed when traders’ limit orders to buy/sell at the close of the previous bar don’t get filled. For example in a bull trend, traders tend to place limit orders to buy at the close of the previous bar, because they are expecting it to drop in the first seconds of the new bar. However, constant buying pressure prevents the price from retreating, thus the limit order remains unfilled. Check out the following example. Despite the decisiveness of a trend, it is bound to end some point. It is important to be able to read the signs as soon as possible and prepare to reverse your positioning. As the trend weakens, it will begin showing more signs of sideways trading and the previously described characteristics of strong trends will fade away. In a bull trend, bulls will begin to lock in profits above the previous bars’ highs, instead of adding to their positions, while bears will begin shorting and scaling in higher, instead of sitting away. 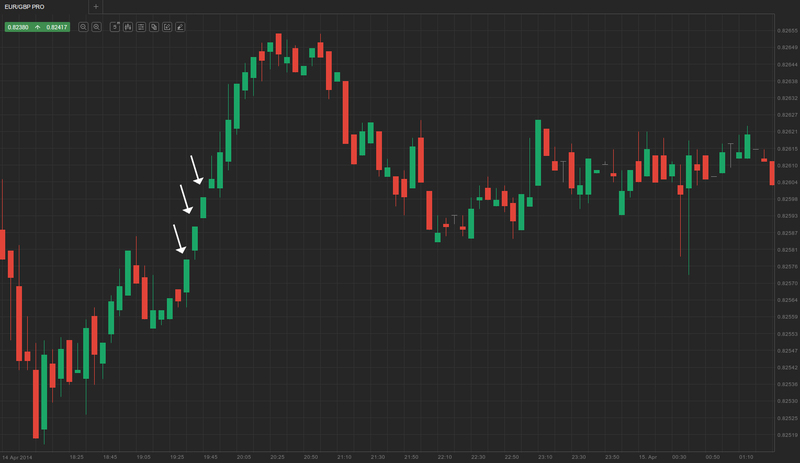 Read up more on trend trading in the next article.